AEM Test series provides latest collection of Multiple Choice Questions (MCQs) related to AEM installation and Configuration, Components, Templates, OSGI, User Administration, Workflow etc in AEM. 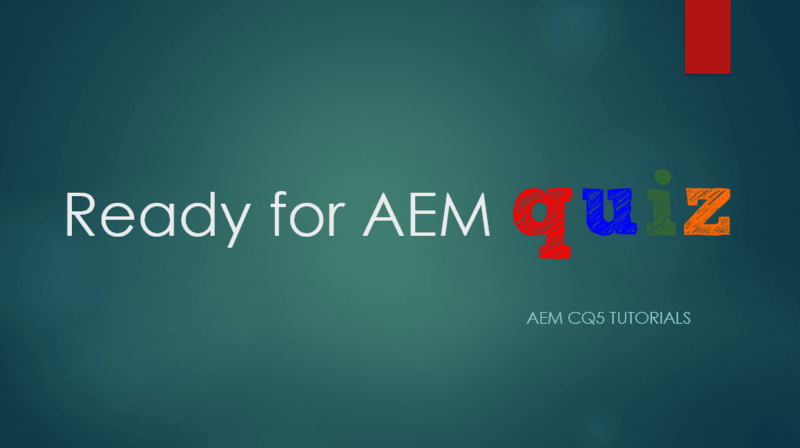 AEM quiz or AEM Test Series is specially designed for helping students and professionals for preparing various Certification Exams and Job Interviews. I have created various test series based on AEM concepts, this is a common post for all Test Series. AEM installation and configuration is the starting point of leaning AEM. It is one of the most frequently asked topic in which interviewer can check your knowledge related to AEM setup. This section contains questions about AEM installation, configurations and troubleshooting. AEM components and templates is the core component of AEM , on which an AEM developer works in his day to day job. This post covers questions on creating, editing and saving content using components and templates in aem. This section contains questions on the process of identifying a user , assigning specific roles and privileges so that user can take specific actions or not. User administration in aem is generally a job of administrator. OSGi is a fundamental element in Adobe Experience Manager (AEM). This section contains questions about configuring and managing osgi services in aem. Workflow is a key application in any Web Content Management (WCM). It allows to execute a series of steps in a specific order. This section covers all the areas which are used for creating workflow in aem. Dispatcher is a caching and/or load balancing tool of Adobe experience manager(AEM). It also helps the application against security and network threats. This section contains questions about dispatcher configuration and usage in aem. 3 Responses to "AEM Test Series"
My question is that how to activate a page programmatically by siteadmin can you please sort out this problem. I am scheduled to appear for AEM Lead Developer certification in few days. Do you have a sample quiz apart from what already exists on this page? Something which can help me with the certification? I am scheduled to appear for AEM Developer certification in next two days days. Do you have a sample quiz apart from what already exists on this page? Something which can help me with the certification?